Farrel Pomini held a grand opening and inauguration celebration for its new corporate headquarters in Ansonia, CT, on May 4 and 5, 2017. The two-day event featured a facility tour and demonstrations on May 4, followed by a continuous mixer user seminar on May 5. 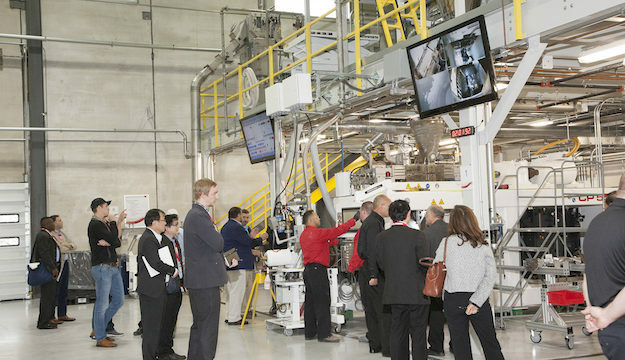 Over 65 customers and other guests attended the event, which included a plant tour of the new company headquarters for continuous compounding systems. 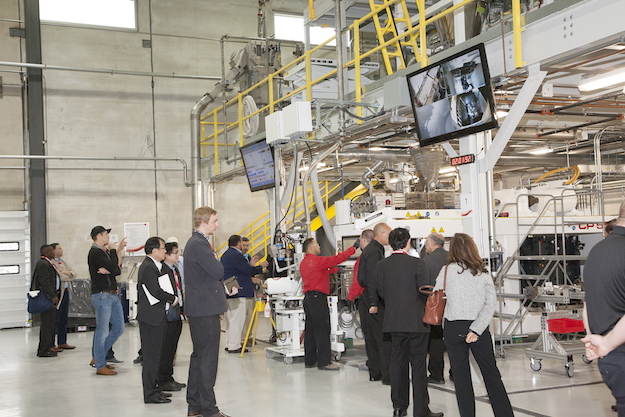 On May 4, small groups of guests were given presentations at numerous departments within the company, including the machine assembly, spare parts, rotor repair and refurbishment, R&D, and automation areas, the processing laboratory and a customer demonstration zone. The demo area consists of a CP550 compact processor equipped with automated upstream materials handling and downstream pelletizing, plus the company’s new CPeX lab-sized compact processor that was introduced at K 2016. At the end of the day, a gala dinner celebration was held under a tent on the company grounds. Employees were relocated to the new building in September 2016. It is located just a few miles from the company’s previous headquarters in downtown Ansonia, which had been home to the company for more than 100 years. The new purpose-built facility features numerous key improvements that boost efficiency in all the company’s business processes. “When designing the new facility, we looked at our entire company workflow, and set out to enhance synergy and communication to generate a more efficient model of interaction, collaboration and process improvement,” said Paul Lloyd, Business Unit Director. “In addition, moving to a new facility has allowed the study and re-working of our machine assembly areas and processes, which can now be configured exactly in line with the requirements of building the continuous mixer and compact processor products. The new facility houses all Farrel Pomini employees at one site, a major improvement over the company’s previous location, where employees were spread out over three separate buildings. Lean methodology was used to design the new facility layout for optimum efficiency. In 2010, Harburg-Freudenberger Maschinenbau GmbH, Farrel Corp. and Pomini Rubber & Plastics Srl integrated to form HF Mixing Group. FarreI Pomini was established in 2011 to focus expertise in the continuous mixing equipment sector of the HF Mixing Group member companies. As separate companies, Farrel and Pomini Rubber & Plastics possess more than 100 years of collective experience in the polymer processing industry. The company specializes in the research, design and manufacturing of continuous mixing systems for the polymer processing industry.